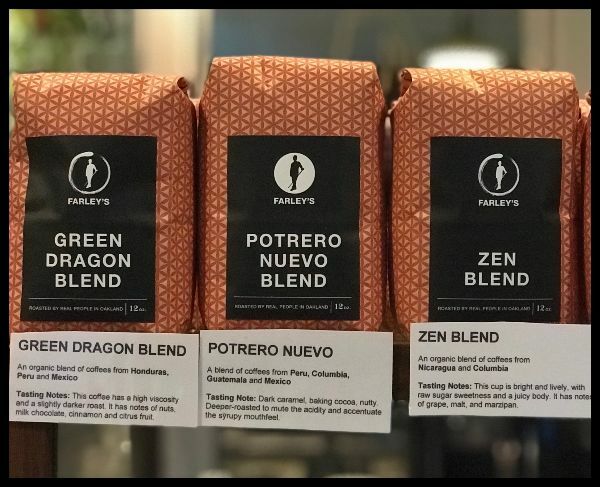 Did you know Farley’s has several of our own custom blends that we roast ourselves? Last month we also re-introduced our original Potrero Nuevo Blend. This is a multi-origin blend with South and Central American beans. For the fans of a medium-dark roast, this can’t miss blend is for you. Come in to try this new roast with a taste of dark caramel, cocoa and nutty flavors. It is roasted to a higher degree to mute the acidity and accentuate the syrupy mouth feel. The aftertaste is pleasant with hints of warm spice. We can’t wait for you to try it! Or any one of our other custom blends. April showers bring May flowers… or so we thought? It looks like the March rains have brought us beautiful blooms all over the state! Warmer weather should be coming our way. Hasn’t it been nice to see the sun with your cup of coffee? Farley’s in Oakland has a brand new Spring menu that was launched just last month. 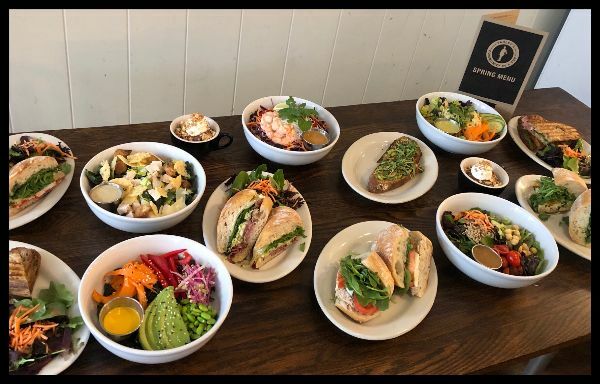 If you’re in Oakland, make sure to stop by and try some tasty salads and sandwiches. Our current favorite is the Thai Shrimp Salad; it’s made with fresh, poached shrimp, rice noodles, lots of veggies and a delicious spicy peanut dressing. San Francisco, you might actually see this as a salad option too! Cheers to new life and new things. How are you planning to fling into spring? 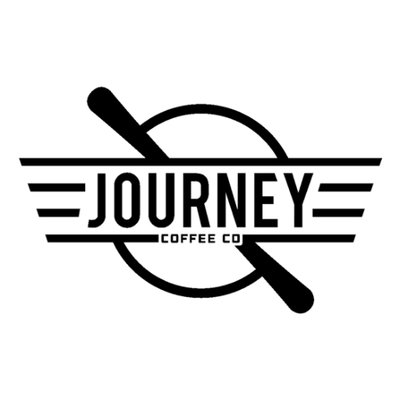 We are Morne and Nicole van Staden, owners of Journey Coffee Co. When we moved to Vacaville, we only knew one thing…we were meant to be in Vacaville. We DID NOT know we were here to start a coffee shop. As life goes, we had a plan, but there was another plan. After losing our job within 3 months of moving here, we had to go back to the drawing board. Two things kept coming up: people & coffee. In summer 2013, a friend approached us about starting a coffee truck. Black Friday 2013, the truck launched it’s business in the Vacaville Premium Outlets. Over the year, the truck continued to operate in the outlets, while visiting local businesses, such as banks and hospitals. There was such a desire for third wave coffee in the Vacaville area that we decided to open a brick & mortar in the Alamo Plaza, along with welcoming our first son. 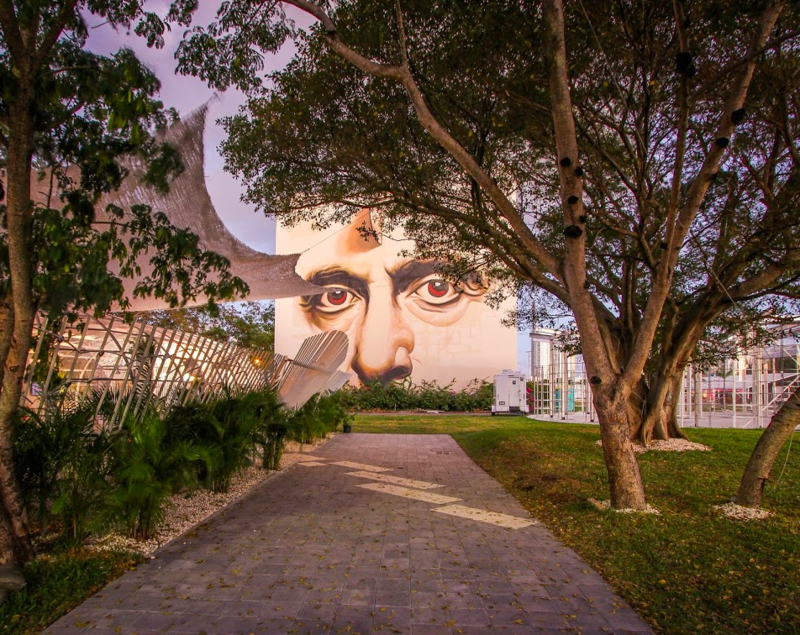 In 2015, Journey took over the building space next door and expanded the menu to offer smoothies, cold-pressed juices, and more food options. This expansion also included the birth of our second son. 2017 resulted in “in-house roasting,” and in early 2018, a second location was launched in Fairfield, CA, shortly after the birth of our third son. The second location has “Phase 1” open, and “Phase 2” and “Phase 3” will open later this year. The next two phases will include a much larger roasting and baking facility, increase capabilities for catering, and include much more seating. As the business grows, there are more opportunities for employment, more seats for people in the community, and more space to display goods from local vendors. Rachel Shayne Edelstein is a graphic designer and artist originally from the North Bay and now living in Oakland. 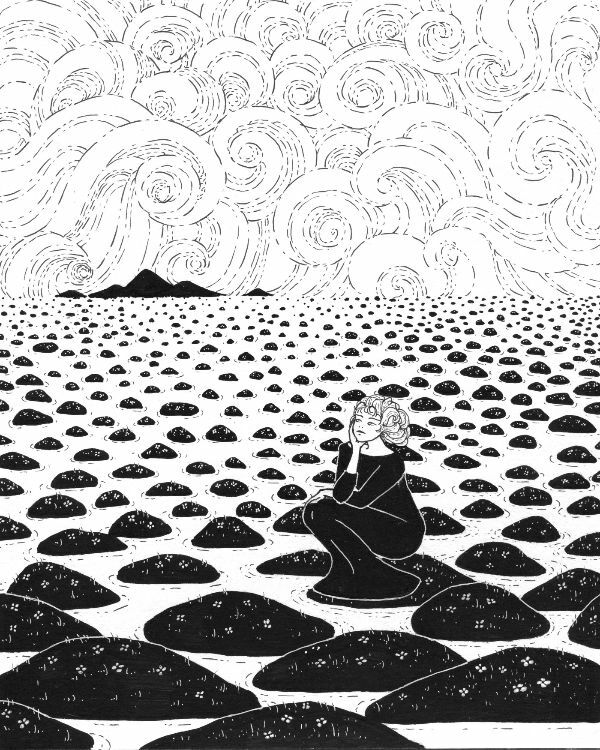 Rachel’s recent body of work features illustrations created as rewards for contributors to her shared crowdfunding campaign. The campaign allowed her and letterpress artist Katie Nealon to publish a coloring book called “Coloring Ladies.” More information about “Coloring Ladies” can be found on Rachel and Katie’s Instagrams: @rachelshayne and @katiemarienealon. The fantasy landscapes and playful imagery of these works stem from an interest in “whimsy” and “ennui;” a pleasant feeling and a dissatisfied feeling. For this show, Rachel screen printed the original drawings mailed to “Coloring Ladies” contributors in 2018. The imagery is inspired by magazine and children’s book illustrations from the early 1900s. Screen print editions, as well as the framed pieces for this show, are available for purchase. 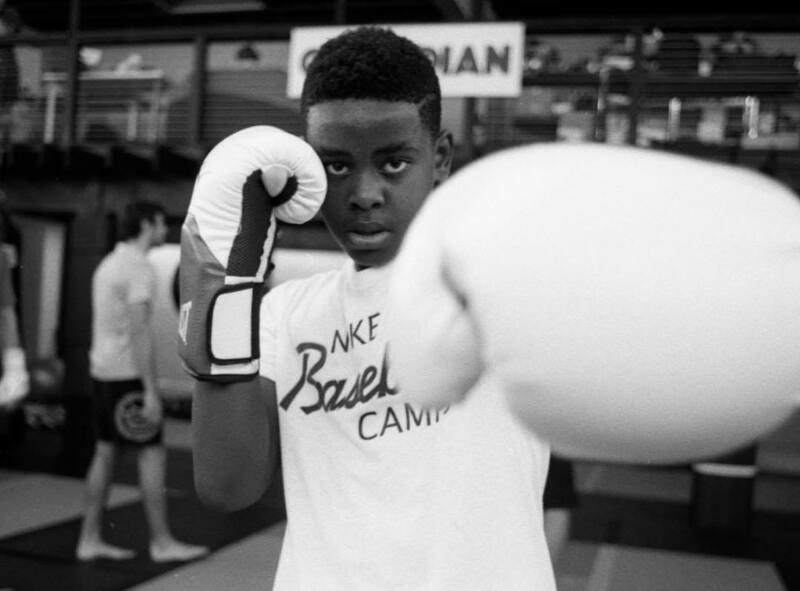 Guardian Gym is a non-profit martial arts academy in downtown Oakland that provides free training in boxing and JiuJitsu to kids 10-18 years old. The gym also offers free academic tutoring and meals donated by local restaurants. Central to the gym’s operations is the belief that it is critical for children in our community to find a healthy and progressive tribe that helps them become better students and family members. We aim to provide that, surrounding a cross section of Oakland’s youth with mentors enthusiastic to teach them life changing disciplines. Description: I am unwittingly drawn to creating images that address the concept of scale, focusing attention on objects that are either naturally larger than our expectations or are portrayed with an unknown size reference point. By teasing visual elements that defy the expectations of size, I wish for the viewer to contemplate the role that we play in the world as well as the vastness of what lies beyond our daily comprehension. 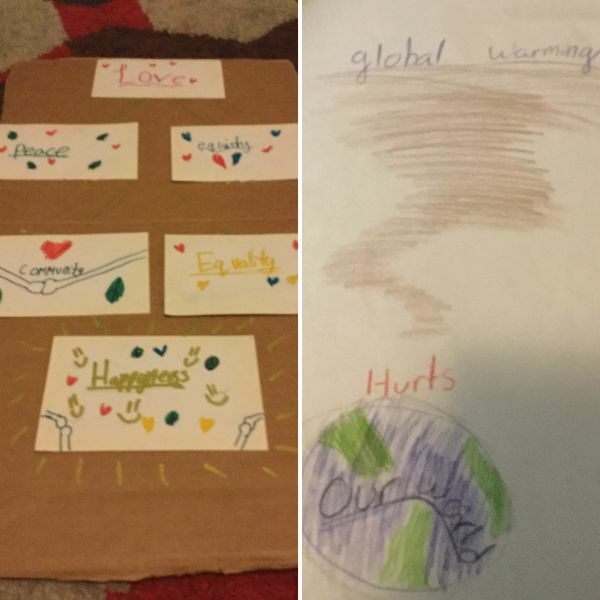 I am ten years old and I sell protest posters and donate the money to immigrant families. I have sold the posters at Christopher’s books before. They are $1 each and can be purchased at the counter inside Farley’s. Tuesday, April 2: Live music by Christine Onyung, a singer-songwriter performing covers and originals, 7:30-9:00 pm. Friday, April 5: Stand up comedy with MC Sergio Novoa, 7:30-9:00 pm. Wednesday, April 10: Live music by GT2+1, playing music of the 20th Century — Beatles, Eagles, Simon &amp; Garfunkel, Clapton, Dylan, Van Morrison — a juicy assortment of tunes, featuring the song stylings of Ms Alyssa Cox, 7:30-9:00 pm. Thursday, April 11: Live music by Ocean Shore Railroad, performing originals and select covers from the 1960’s to the present, 7:30-9:00 pm. Saturday, April 13: Live music by Frances Ancheta, a singer songwriter with pop, folk, indie rock, new wave, and world/tropical influences, 7:30-9:00 pm. Wednesday, April 17: Live music by the ever-popular Soul Delights. Join us for a lively performance, 7:30-9:00 pm. Thursday, April 18: Live music by James Everett, an R&B, Jazz and pop singer and performer, 7:30-9:00 pm. Saturday, April 20: Live music by Paula O’Rourke and Carlos Mendoza, performing Catalan and Venezuelan songs, 7:30-9:00 pm. Sunday, April 21: Open regular hours for Easter. Tuesday, April 23: Live music with duo Teresa Tam and Maxi Larrea, an exciting repertoire encompassing everything from classic and modern tango and jazz to experimental fusions that breath new life into familiar songs, 7:30-9:00 pm. Saturday, April 27: Live music by Marc Maynon and CD Onofrio, performing folk music, 7:30-9:00 pm. Farley’s SF is looking for nonprofits and artists to display in the window boxes. If you’re interested, please email darby@farleyscoffee.com. Farley’s East is looking for nonprofits and artists to display in the window boxes and the walls. If you’re interested, please email jillian@farleyscoffee.com.